The final lip balm smells amazing – lightly coconut with the slightest hint of sweet honey. And while some chapsticks quickly seem to either disappear in minutes or feel like a waxy coat on top of your lips, this one stays on your lips for a long time without feeling sticky or heavy. You can also rub it into your hands or feet – any skin, really – and it’s a great natural body butter. It’s a very basic recipe, but effective. 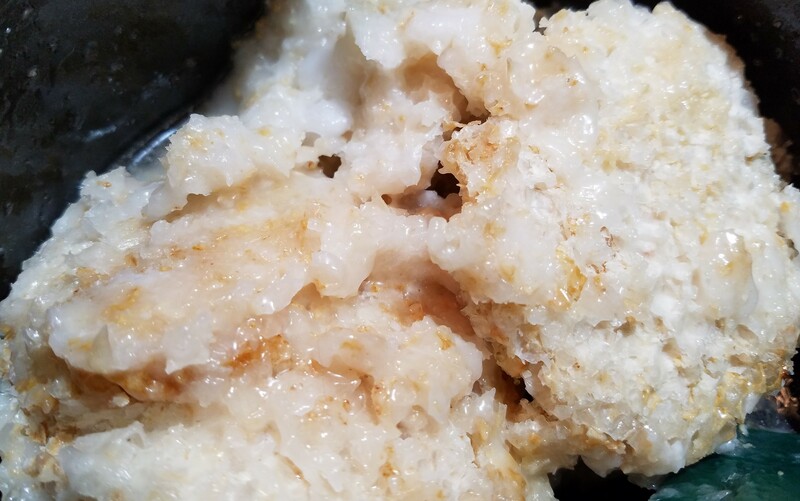 It’s a mixture of equal parts natural raw beeswax & organic coconut oil. Here’s a step-by-step video walk-through showing you how I did it. Because we keep backyard bees, we were spoiled & had access to the freshest raw beeswax comb around. Because the organic beeswax is the most expensive part, start by measuring that first. Once you know how much wax you’re using (we had 1 cup), measure an equal amount of coconut oil. Combine them in a small pot. Put your pot on a low heat. My burner ranges from “low – 10”, and I had it on 2, which was plenty. 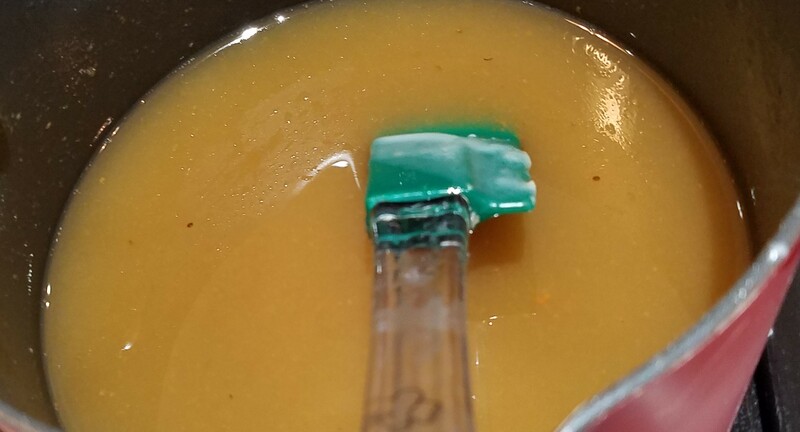 It’s important to understand that wax has a higher melting point than coconut oil, so you’ll see the coconut oil liquefy much sooner than the wax. Be patient and keep mixing. After a few minutes, some of your wax will have melted, but it will still chunky & weird. Almost like an awkward porridge. Keep it on low heat, watching & stirring. The majority of the light speckles you see in the photo below are unmelted wax that will dissolve over the next few minutes. Within 10 minutes, your DIY lip balm mixture should be entirely melted. 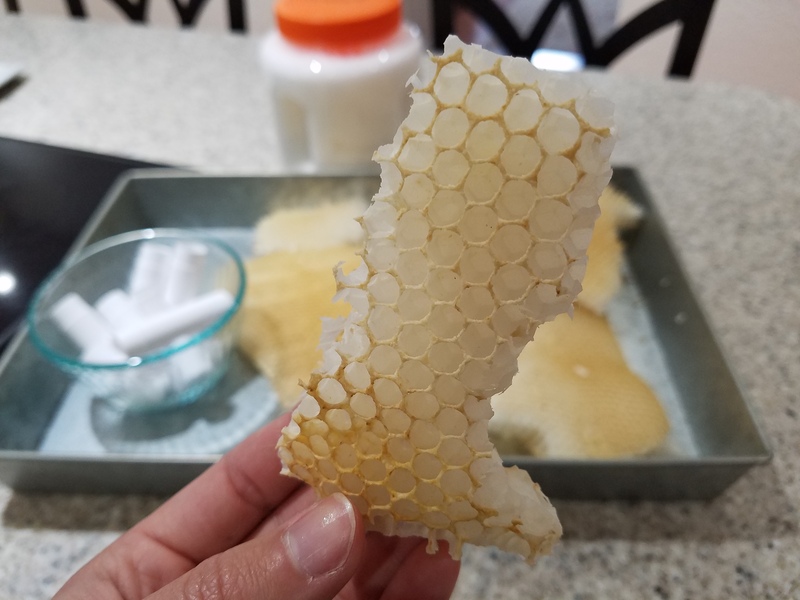 Since we used raw wax comb straight from the beehive, we didn’t filter our wax, and it had some pollen particles in it, which is what you see below. Pollen bits in the final product don’t offend me, so I didn’t bother to strain the wax ahead of time. Once it’s completely melted and well-mixed, this hot liquid mixture is ready to pour into molds or tubes. 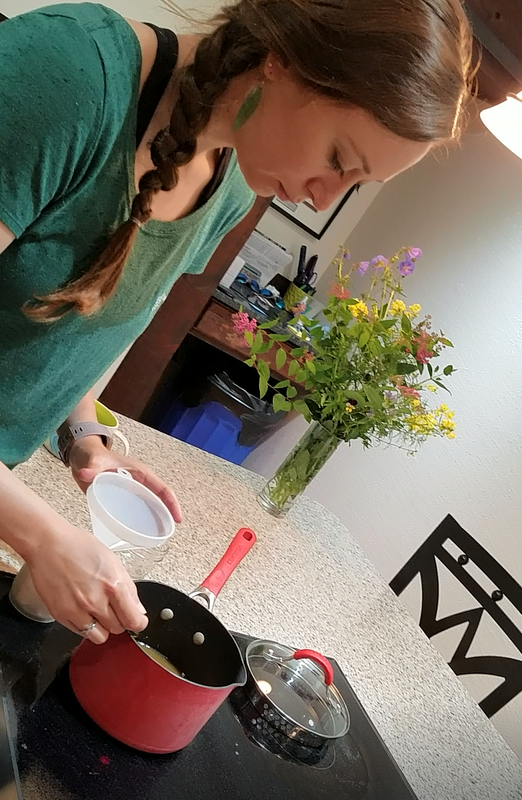 As soon as your take the organic wax & coconut oil blend off the heat source, it will start cooling, solidifying around the edges and on your spatula. You’ll need to work relatively quick. 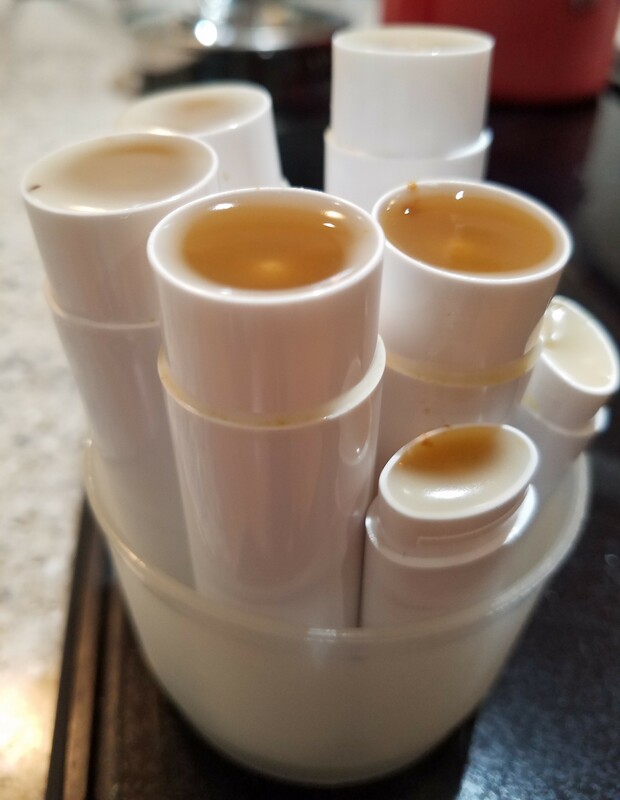 Set up your chapsticks tubes (or whatever container you prefer) & use a small funnel to pour. Remember – it’s hot, so be careful! If you find it solidifying in the pot before you can portion it all, just heat it back up for a few minutes until it’s a workable consistency again. 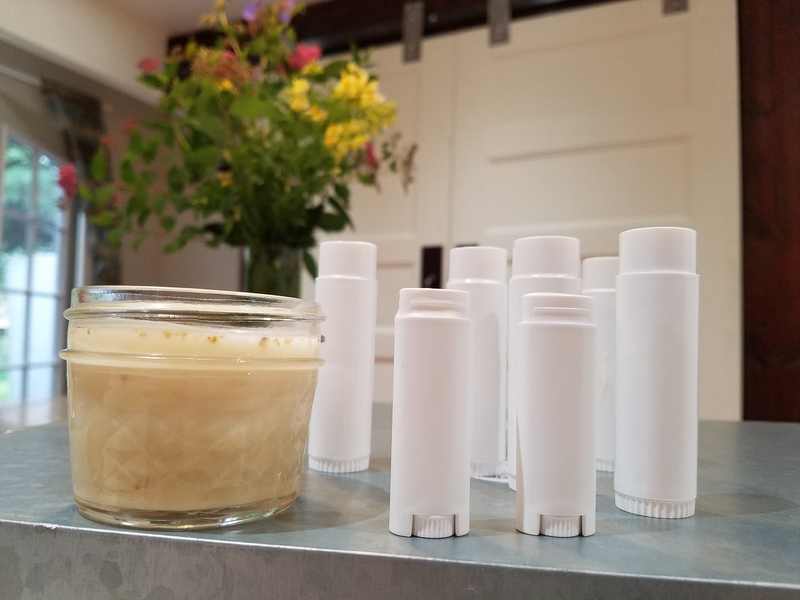 After filling chapsticks tubes of various sizes, we ran out of tubes & still had leftover product. It also works well as a thick body butter, so we poured the rest into a glass jar either for use on hands/feet or future re-melting. We let everything cool overnight so they could completely set.